This article explores the underlying rationale for corporate prosecutions and how the framework in Australia could be better developed to serve that rationale. Potential reforms are considered through a comparative analysis of the corporate prosecution frameworks in place in the United States and the United Kingdom. The changes proposed to the Australian system include amendments to prosecutorial guidance and policy as well as the introduction of pre-trial diversion schemes, such as deferred prosecution agreements. This article critiques the misleading or deceptive conduct financial services provisions in the Corporations Act 2001 (Cth) and the Australian Securities and Investments Commission Act 2001 (Cth). This discussion is informed by regulatory and consumer protection theory to assist in understanding who the Australian financial services consumer is and which mechanisms are most suitable to protect them. 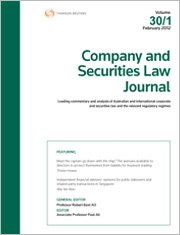 By reviewing cases decided prior to and after financial services were excluded from the Trade Practices Act 1974 (Cth), this article compares decisions under the Trade Practices Act 1974 and the Australian Consumer Law, found in Sch 2 of the Competition and Consumer Act 2010 (Cth), and the Corporations Act 2001 and/or Australian Securities and Investments Commission Act 2001. This article postulates that the current legislation has created confusion, uncertainty and inconsistency and accordingly, should be formally reviewed. The report of the 2014 Financial System Inquiry (Murray Report) marked the culmination of a series of public inquiries questioning the effectiveness of the regulatory regime governing financial services in Australia – a regime established following the recommendations of the previous Financial System Inquiry in 1997. The first part of this article examines the structural and conceptual deficiencies in the financial services regime established following the 1997 inquiry, adopting the Westpoint collapse, the Storm Financial collapse and the Trio Capital fraud case as case studies highlighting the regime’s particular vulnerabilities. In particular, it argues that the failings of the financial services regime implemented following the last inquiry were caused by an over-reliance on disclosure obligations, a weakness in the regulation of financial advice, and a lack of appreciation for the increasing impact of the superannuation regime in exposing unsophisticated investors to the market. The second part of the article examines whether the reform proposals made in the Murray Report and other public inquiries, and the passing of the Future of Financial Advice reforms, are likely to be successful in rectifying the weaknesses identified. The measures proposed would substantially strengthen the integrity of the financial services regime; however, further reform is needed. Subsequent reform should focus on enhancing the superannuation regime as a key platform for “financial citizenship”, facilitating access to quality financial advice and imposing greater restrictions upon inappropriate investment.